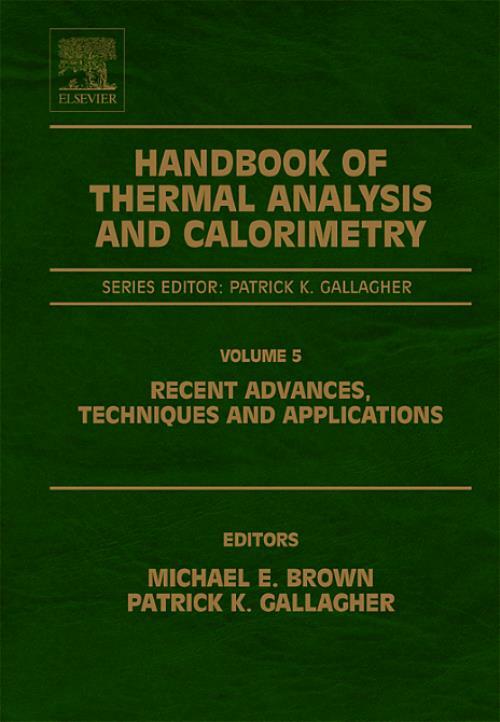 This is Volume 5 of a Handbook that has been well-received by the thermal analysis and calorimetry community. All chapters in all five volumes are written by international experts in the subject. The fifth volume covers recent advances in techniques and applications that complement the earlier volumes. The chapters refer wherever possible to earlier volumes, but each is complete in itself. The latest recommendations on Nomenclature are also included. Amongst the important new techniques that are covered are micro-thermal analysis, pulsed thermal analysis, fast-scanning calorimetery and the use of quartz-crystal microbalances. There are detailed reviews of heating - stage spectroscopy, the range of electrical techniques available, applications in rheology, catalysis and the study of nanoparticles. The development and application of isoconversional methods of kinetic analysis are described and there are comprehensive chapters on the many facets of thermochemistry and of measuring thermophysical properties. Applications to inorganic and coordination chemistry are reviewed, as are the latest applications in medical and dental sciences, including the importance of polymorphism. The volume concludes with a review of the use and importance of thermal analysis and calorimetry in quality control.